Both the Kobe 9 and Kobe 10 are going to go down as some of the most seldom seen on-feet looks in Kobe Bryant‘s career given his recent injuries, but that hasn’t stopped Nike from dolling out a number of Player Exclusives. 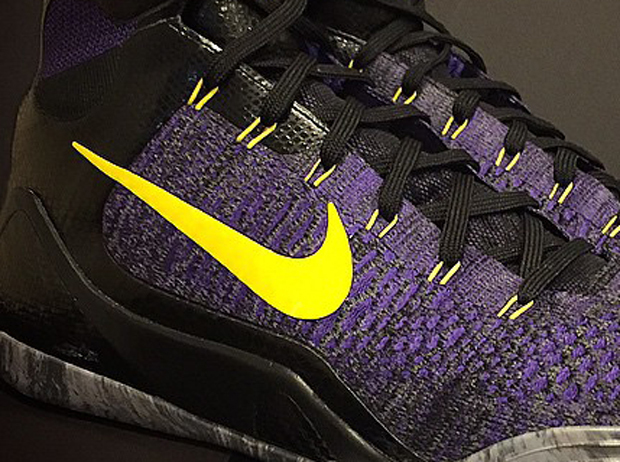 The latest look features a Lakers Away motif complete with a cement grey outsole featuring a marbled camouflage. A Laker purple base helps the vibrant yellow dynamic flywire, Swoosh, and sheath Kobe logo stand out while black portions of the sneaker feature a patent snakeskin texture. Continue onward for a better look at the latest Nike Kobe 9 Elite PE and stay tuned for more Kobe updates right here on SneakerNews.